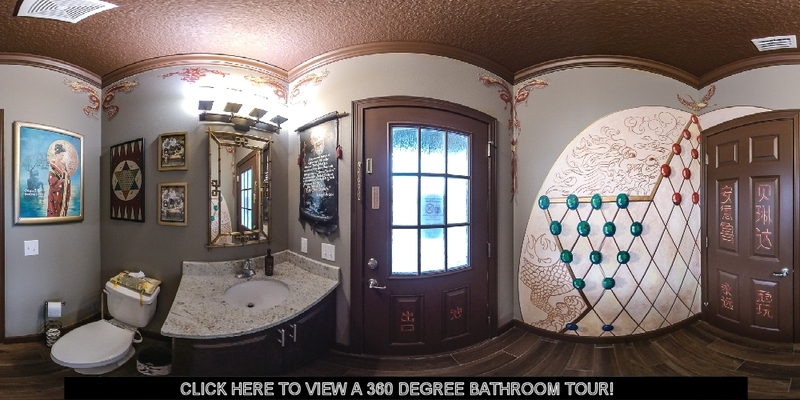 Every bathroom at The Great Escape Parkside is luxurious, whimsical, or both. They all follow the themes of the rooms they adjoin and several bathrooms even serve as carefully crafted parts of interactive games you can play! In all, our Great Escape has 12 full bathrooms and 1 half bathroom. The full bathrooms are all equipped with hair dryers, mirrors, drawers, cabinets, privacy locks, and plenty of towels; Ten of the full bathrooms are private/ensuite bathrooms and the remaining two are "Jack-N-Jill" style bathrooms located between two bedrooms and sharing dual vanities. 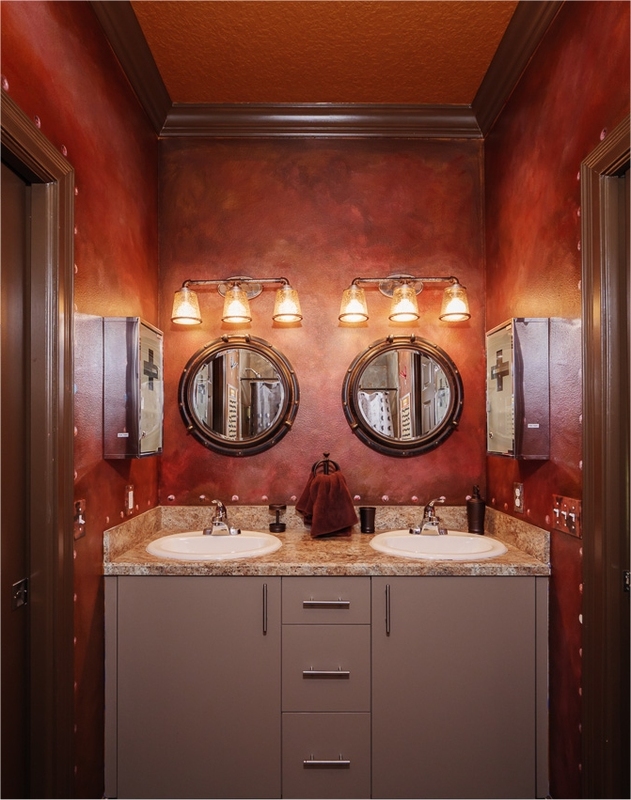 A luxuriously "swanky" bathroom overflowing with granite and high-end finishes, the "dressing room" features a Bluetooth-capable vanity mirror through which you can actually play music from your own device! The toilet (appropriately named "the hot seat!") is decked out with Japanese style electronics capable of warming, washing, and more! This stunning bathroom is decked out with porcelain and marble finishes. Custom-made tiles that look just like high-end playing cards are scattered around the floor while elegant finishes complement the experience. the scene is just as crazy as it is in the bedroom. The X-Box/Playstation bathroom features a Nintendo Switch video gaming console connected to the wall and Colonel Mustard's "CLUEless" bathroom continues the escape room game of its adjoining bedrooms. The slide show below will give you a peek at each of our 13 bathrooms!